By Peter Anderson 20 Comments - The content of this website often contains affiliate links and I may be compensated if you buy through those links (at no cost to you!). Learn more about how we make money. Last edited August 28, 2017 . One thing my wife and I have been doing lately is to try spending less on entertainment and “fun money” than we have in the past. We know if we want to get ahead we need to cut down on those miscellaneous entertainment dollars. Cutting down on those dollars doesn't mean we can't have any fun, however. Here's a few ways that we're having fun, on a budget. We've started having game nights, both with each other, and with our friends. It makes for a fun night, and once you purchase some games, doesn't cost anything additional! Here are a few of our favorite games that we've been playing lately. Most of these games can be bought for between $20-30 on Amazon, or slightly cheaper used on ebay or craigslist. Settlers of Catan: Settlers of Catan was one of those games I wasn't sure that I was going to enjoy. It seemed a little strange, something that only people who enjoy role playing games would enjoy. Boy was I wrong! This game is so much fun that I bought an arcade version for our Xbox as well! Plus, there are a ton of expansion packs that can keep this game fresh for years to come. 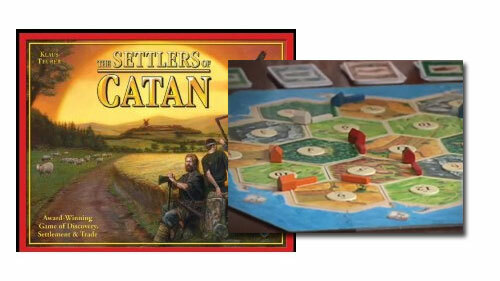 From Amazon: The Settlers of Catan from Mayfair Games is an award-winning strategy game where players collect resources and use them to build roads, settlements and cities on their way to victory. The board itself is variable, making each game a little different from the next. Each round of The Settlers of Catan is intended to keep three or four players ages 10 and above engaged for up to 90 minutes. Carcassonne: Carcassonne is another European style board game that has refreshingly different and never dull game play. 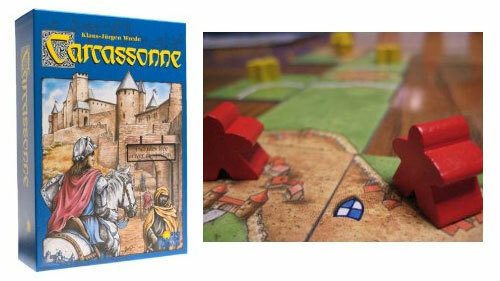 From Amazon: The Carcassonne is a clever tile-laying game. The southern French city of Carcassonne is famous for its unique roman and medieval fortifications. The players develop the area around Carcassonne and deploy their followers on the roads, in the cities, in the cloisters, and in the fields. The skill of the players to develop the area will determine who is victorious. The game is for ages 8 and up and 2 to 5 players. Blokus: We just bought Blokus over Christmas using gift cards we had received. You can think of the game as a sort of the board game equivalent of Tetris. You have 4 teams all trying to fit their differently shaped blocks into the board. Whoever fits the most of their pieces into the board wins! There's a lot of strategy involved, and its surprisingly fun to play! 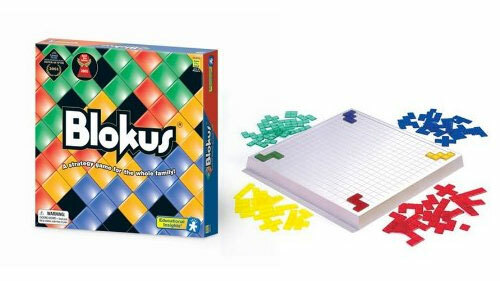 From Amazon: Fun for both kids and adults, Blokus is a strategy board game that challenges spatial thinking. Bright colors and simple rules make it ideal for ages five and up, but adults will certainly be engrossed by this unique and challenging game. Ticket To Ride: Ticket to ride is another board game that really is quite a bit different from a lot of the board games we have become used to here in the U.S. I've played this on the Xbox 360 as well, and it's a lot of fun! 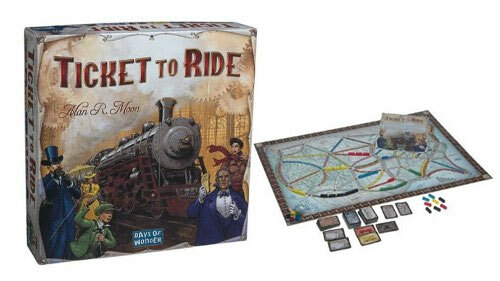 From Amazon: Ticket to Ride is a cross-country train adventure where players collect cards of various types of train cars that enable them to claim railway routes connecting cities throughout North America. Farkle: Farkel is a fun game for parties where you pass around a cup of dice, trying to score on different combinations of dice. It's a fun, and sometimes frustrating game! From Amazon: Farkel is a fun, fast-paced, high-score game that takes just two minutes to learn. You roll six dice, remove only the dice you want to use for points, then re-roll the remaining dice. Some scoring dice must be removed after every roll. If you can eventually make all six dice count for score, pick them all up and keep going. If none of the dice you roll count for score, you lose your turn and any points you made during that turn. The first player to score more than 10,000 points, wins. 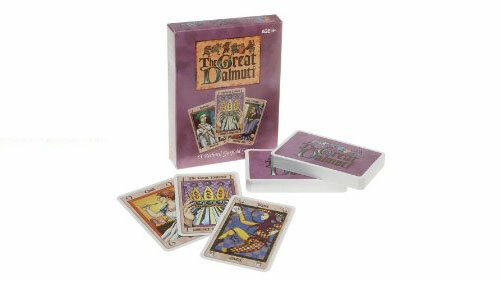 The Great Dalmuti: The Great Dalmuti is a fun fast paced card game where the whole goal is to become a part of the Dalmuti ruling class. The game is easy to learn, and can quickly turn into an all night game. From Amazon: The deck is dealt out to all players and the object is to get rid of your cards as fast as possible. The person who first got rid of all his cards becomes The Great Dalmuti. Seat positions change and the cards are re-dealt. Quite a unique game in which no score is kept. Have a movie night at home, instead of going out and spending $20+ on a first run movie! Here are a few ways to make it cheap. Rent a Redbox Movie: Head to your local McDonald's, grocery store or gas station and rent a new release movie for $1! If you want to make it even cheaper, check out my article on getting free redbox rentals. Netflix DVDs and Streaming: If you've got a Netflix.com account, plan ahead, and pick one of their movies to be sent for movie night. You're paying for the account, you may as well use it, right? Even better, if you have a Netflix account and an Xbox 360 you can now stream selected movies to your console, some even in high definition! No waiting! The selection isn't the greatest yet, but it is expanding every day. Sign up for a free 2 week trial at Netflix here! “Rent” a Movie from the Library: Want to make it especially cheap tonight? Stop by the library on the way home and get one of their movies for free! You can usually keep it longer than a regular rental, and the price can't be beat! Selection may vary depending upon your location. What Are Your Cheap Entertainment Ideas? So there are a couple of ideas for ways to have some fun, on a budget. We've been doing it quite a bit lately, and we're saving a lot of money! What are some ideas that you've come up with for your family to have fun without spending a lot of dough? Leave a comment and share your idea here! Last Edited: 28th August 2017 The content of biblemoneymatters.com is for general information purposes only and does not constitute professional advice. Visitors to biblemoneymatters.com should not act upon the content or information without first seeking appropriate professional advice. In accordance with the latest FTC guidelines, we declare that we have a financial relationship with every company mentioned on this site. Don’t forget about the more traditional games like Monopoly, Scrabble, and card games. And playing Charades (http://www.cs.umd.edu/~nau/misc/charades.html) or “Pictionary” (just guess what other people draw) can be free or at least really inexpensive. Also, we have amassed a rather large DVD library, so we try to re-watch movies whenever we find ourselves wanting to rent something new. If you have any sort of “OnDemand” programing through your cable/satellite provider – there are probably a lot of things you can watch for FREE! Check out the offerings – you never know what you’ll find. Those are all great ideas as well! I didn’t list some of the traditional games just because most people have heard of them, and i wanted to list some games that maybe some people hadn’t heard of yet. Thanks for contributing! These are some great game suggestions. Our boys got a lot of traditonal games for Christmas and we have been having fun playing them. I could see them liking a few of these as well. Thanks for the suggestions. I’m actually working on a post of the same topic right now. I have never heard of any of the games you mentioned above, ha. Game nights are definitely a great way to stay in, save money and have fun. Other more recent games I would recommend would be SceneIt and Rock Band. Rock Band is a great way for a group to lose themselves, have some fun and basically a more advanced kareoke. If you want more of a night, have a house/apt party where it’s byob. Every person can bring something a little different whether food or alcohol and the host doesn’t have to front as much money. I forgot all about scene it! We have scene it for the xbox, and it is a ton of fun. You have 4 buzzers to buzz in with, and it’s very interactive. We also love Lips – a karaoke game for the xbox. Great for big parties like you mentioned. Cool list, Pete. We have a second-run “dollar theatre” that we go to every now and again. Tuesday nights the movies are .50. Fifty Cents! Frugal fun is the best kind. I’ll have to add that to the list next time – we have a second run movie theater too. It’s only $2.50 normally, and $1 on Tuesdays. Great for a cheap date! Another good entertainment involves a careful scouting of happy hour specials. For example, McCormick & Schmicks (which I know isn’t just in WA) has $3 happy hour food. A good way to unwind, get a snack and not spend a fortune! Apples to Apples – that’s another good one that we don’t own. thanks for the reminder! I like the movie heckling idea too – kind of like mystery science theater – but more interactive! Our favorite cheap entertainment is Rock Band and World of Warcraft – much cheaper than going out. We also really enjoy Cranium and good ol’ fashioned chess. for a second there i thought your comment said “good ‘ol fashioned CHEESE”. hah. Chess makes more sense, although I do love cheese! Our family enjoys movie night! Settlers is an awesome game! I’ve been planning a similar post on these games! I’m a huge fan of Euro Strategy games and have several Carcassonne and Ticket to Ride games. I just got Settlers of Catan and a bunch of others that I still have to learn to play. Euro games are great because both adults and kids and enjoy them, and they never get old because of the different strategies that can be used to win, and are way better for your brain than watching TV. Next Post: Are You Making A Pascal’s Wager With Your Finances?